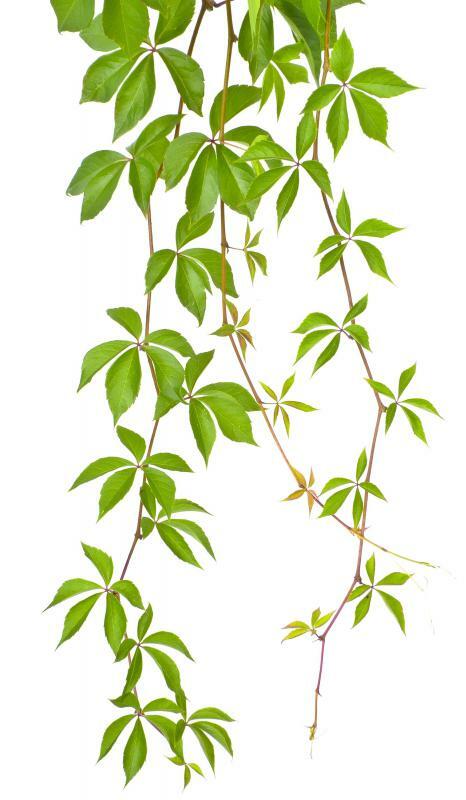 Virginia creeper, which has five leaves, is often confused with poison oak, which has three leaves. 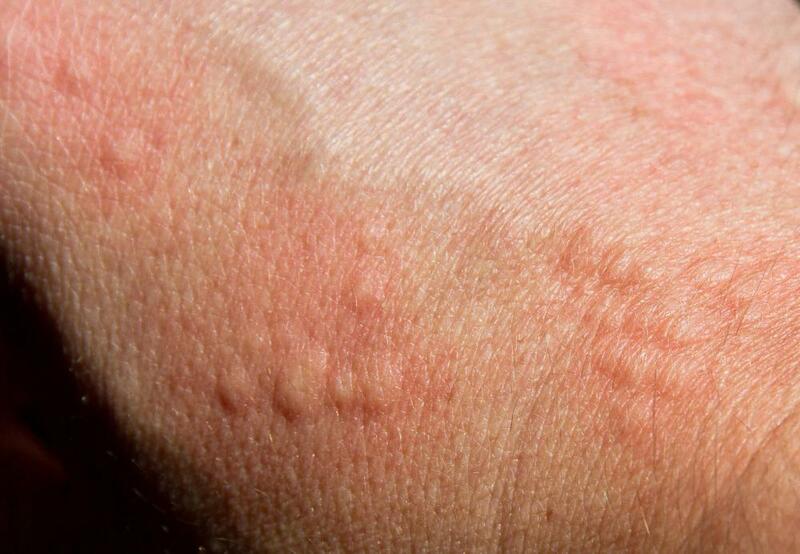 Some people may develop hives as a reaction to Virginia creeper vine. Virginia creeper vine or Parthenocissus quinquefolia is a climbing vine native to the Eastern Seaboard of the United States. It is often mistaken for poison oak, an unrelated plant which looks somewhat similar physically. Some gardeners actively cultivate Virginia creeper as a climbing vine and groundcover, while others view it as a harmful invasive, and work to eradicate it. This vine has tough, woody stems and stalks, and five-pointed palmately divided leaves. The leaves are light to dark green in spring and summer, but in the fall, they turn yellow, red, orange, and sometimes even burgundy in a flash of rich fall color. Although the Virginia creeper vine does flower in the fall, it is primarily cultivated for the brilliant foliage, which can add a great deal of color to a garden in the fall months. Generally, people in USDA zones three through nine can grow this vine with great success. Gardeners who actively cultivate Virginia creeper usually start with small starts or cuttings, planting them in a sunny spot. If a climbing growth habit is desired, a trellis, fence, or set of stakes is needed to support the vine and encourage it to grow. The plant can also be grown as a groundcover to provide a stretch of smooth, low-maintenance foliage in the garden. Many people like to use it in the back of the garden, where the flashes of color will really stand out in the fall. The issue with Virginia creeper vine is that it is extremely invasive. It grows very rapidly, and it thrives in a wide range of environments, including salty and acidic soils. If the vine manages to work its way to a building, it will indelibly wrap itself into the siding, which means that the building could be damaged by attempts to remove the plant. It will also choke out other plants with ease. In addition to being somewhat invasive, Virginia creeper vine also contains oxalic acid, which can act as a mild skin irritant. This enhances the confusion between Virginia creeper and poison oak, since the plants both cause skin irritation and have similar foliage, although poison oak has three-segmented leaves, not five-segmented leaves. Some people may have an extreme reaction to the plant, and they may develop hives, difficulty breathing, and other severe allergic symptoms in response to exposure. What Is a Jade Vine? What Is a Rangoon Creeper? What is a Princess Flower? What are the Different Types of Pea Vine? I agree wholeheartedly. The only thing I've found that helps control the rash is Technu. I'd like to find the guy who planted it on my property originally and punch him the mouth. I find it hard to characterize the chemical burn type rash associated with exposure to Virginia Creeper as "mild". I have found Calodryl to be effective in reducing the discomfort somewhat. One serious issue is that unlike liquid usherol oxalic acid crystals do not wash away and can be spread with bar soap or wash cloth. I see no reason to differentiate between it and other toxic plants.